Not all body language at work is created equal. Some gestures may be acceptable in a manager but not in a lower rank employee e.g. the pat on the back. Some gestures are perceived as manly, thus acceptable only when men make them, e.g. crossing a leg by placing an ankle over the knee. The list below is designed to help you decode body language at work. A smile can be genuine when the eyes are also smiling. It appears fake when only the mouth is smiling. If someone holds a smile for too long, they may be seen as dumb or people pleaser types. Pursed lips generally mean the person is refraining from expressing dislike. Pouting lips generally mean the person is refraining from expressing a complaint, hurt or dissatisfaction of some sort. Biting lips generally mean the person is worried, or it could be just a habit, their mouth could be dry. Parted lips mean either the person is flirting or they can’t close their mouth for whatever reason. Tight jaws are a sure sign of being stressed out or uptight, perhaps dissatisfied with something you said, or something they are thinking about. People also tighten their jaws to stop their lips from trembling. When a person’s face turns red: The most common reason is embarrassment, but it could also mean the person is really angry. When a person frowns, the person could be worried, or angry. Sometimes people have a permanent frown that is not relevant to any given situation, it’s just a habit they got into and may not reflect their current frame of mind. You’d think that a smooth forehead would mean that the person is serene and content. Not necessarily so. With the popularity of Botox injections, some people don’t frown anymore, so you could be facing an angry person with a smooth forehead. When someone is nodding their head, they are letting the speaker know that they get the message. If the nodding is excessive, the person is trying to please the speaker. Observe this dynamics in a meeting, where a higher up is speaking and some people are nodding in excess. Leaning head on hands while tilting head back could mean the person is distracted, daydreaming, or about to fall asleep. It could also mean they are skeptical about what you’re saying. Leaning head to the side, fully facing you generally means the person is giving you his/her attention, ready to listen. Head bowed down could mean embarrassment, shame, or just respect for authority. Sometimes, the person may be hiding something, but the gesture alone can’t tell you that. This is a gesture that is hard to read accurately. Head shaking side to side means disapproval. Covering face with hands could mean a number of things: self-consciousness, or hiding something. This is far from conclusive, you may be better off asking the person why they cover their face. Twirling hair may mean the person is nervous. It could just be a habit. Touching hair and other self grooming means the person is either self-conscious or flirting with you. You can read entire books just on interpreting the language of the eyes. Let’s cover the basics. In the U.S., avoiding someone’s eyes is seen as a sign of lying, not so in other cultures, where sometimes the person may look away out of respect or other reasons. NLP (Neuro-linguistic Programming) studies have found that there is a relationship between the direction of someone’s gaze and the source of the message in the brain: either a memory (eyes looking up left) or a fabrication (eyes looking down left). If you are suspecting someone is making things up, check the direction of their gaze, they may just be trying to remember. A good reference book about this is NLP at Work by Sue Knight. Another type of eye nonverbal message is pupil dilatation. Pupils dilate when you see something that pleases you. They also dilate right after an eye exam. Before you conclude someone is happy to see you, check if they just came back from an eye exam. 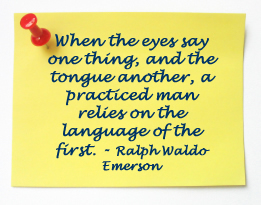 When someone rolls his/her eyes, they are letting you know that they find what you say exasperating. You may want to ask them about it, so you know why they do it and can take some action about it. Leaning forward: This gesture, almost unmistakably means the person is engaged and showing interest in what you are saying or doing. But... it could also mean the person is just more comfortable in that position. Crossing arms or legs Conventional wisdom tells us that crossed arms mean the person is closed to whatever is hearing or seeing. But a person could cross their arms because of being cold. Or because it’s just more comfortable at the moment. Pats on the back are generally given by someone higher in the hierarchy. I’ve seen top executives cringe when someone that is lower in the totem pole gives them a pat on the back. A sticky situation arises when your boss is giving you pats on the back that you don’t welcome. Use your judgment about stopping this. If the unwanted pats are infrequent, let it go, but if it’s getting on your nerves, approach your boss about it, otherwise it’ll build unnecessary resentment. When a person puts a hand on his chest, it means real sincerity or they may just be trying to appear sincere. When someone shows their palms, it’s a gesture of openness and approachability. When the hands are in their pockets, they may be nervous or trying to appear nonchalant. A limp handshake doesn’t really mean anything, but it’s seen as weakness or too much daintiness. A pulverizing handshake is seen as dominant. Somewhere in the middle is a confident handshake, not limp, not pulverizing. When a person shakes your hand using two hands, as in a sandwich, it means extra care. It could also be a reflection of dominance. Or a mix of both. Legs crossed at the knee or at the ankle may indicate closed attitude but they may also mean the crossed legged person is more comfortable that way. No easy conclusions here. When a person is tapping his/her foot, they may be bored or in a hurry and telling you to hurry, too. When a person adjusts their feet to pointing out toward the door, it’s likely they are about to (or want to) get up and leave. They may just be waiting for the right moment to take off. A person using a high pitched voice is seen as child like and emotionally upset. Sometimes the person speaks that way naturally, so don’t hold this against them. A person speaking in low volume appears as insecure. A person speaking in loud voice is seen as boisterous or energetic. Voice volume is totally under a person’s control, you decide what level you use when. Tone of voice can reflect the person’s mood: pessimistic or optimistic. Interpreting tone of voice is extremely useful to assess the speaker’s current frame of mind. Even though tone can be controlled to a degree by the speaker, it is usually not faked. Knowing how to interpret body language at work is very useful, as long as you are always aware that you can’t give 100% weight to the nonverbal cues you are getting. Always use the nonverbal cues to complement the message. When the body language contradicts the rest of the message, it’s likely that the body language is more reflective of the truth. Defensive Body Language Detect when you (or others you are talking to) start to get defensive. Job Interview Body Language Decode the messages interviewers and you are exchanging with your body. Examples of Nonverbal Communication In this article you can read about how non verbal communication is sometimes misinterpreted.